Being able to physically interact with plants is pretty much the only thing I miss about gardening during the winter. But, it’s another reason to look forward to spring, and something I like to keep in mind when I plant my gardens and containers for another growing season. I have lots of favorites for gardening by feel, but I’ve tried to narrow it down to my top five. 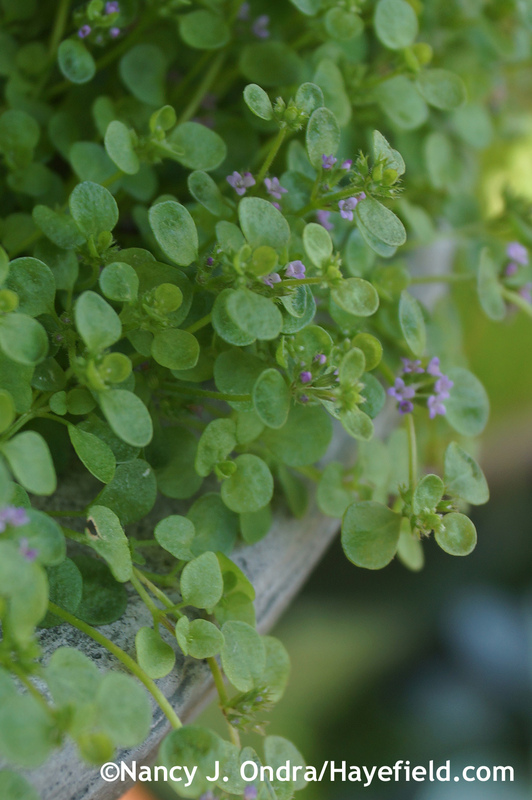 Herbs of all sorts were one of my first loves, but if I could choose only one genus, it would be Mentha: the mints. 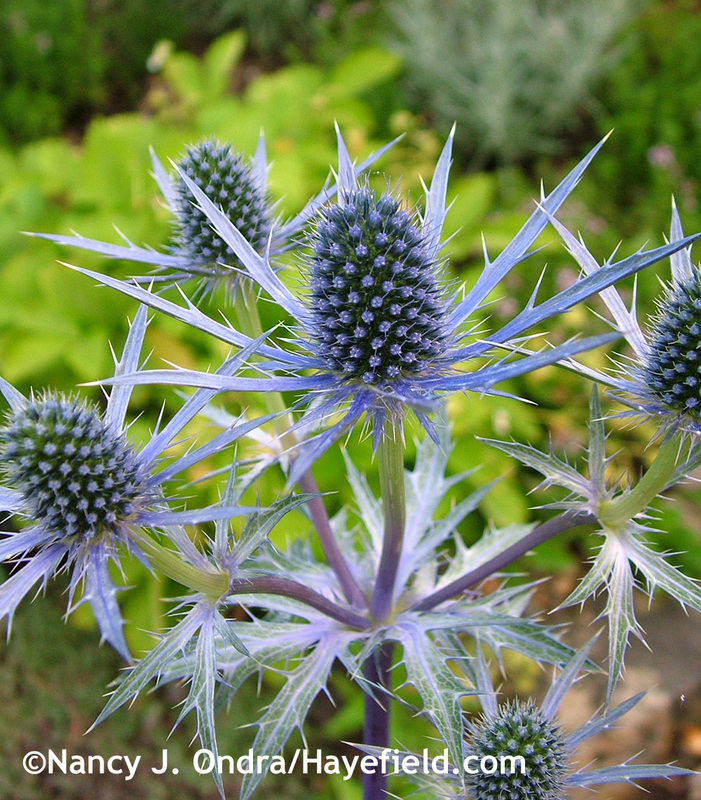 It’s in their nature to be spreaders, but that’s okay, because they can adapt well to life in a pot for a year or two. 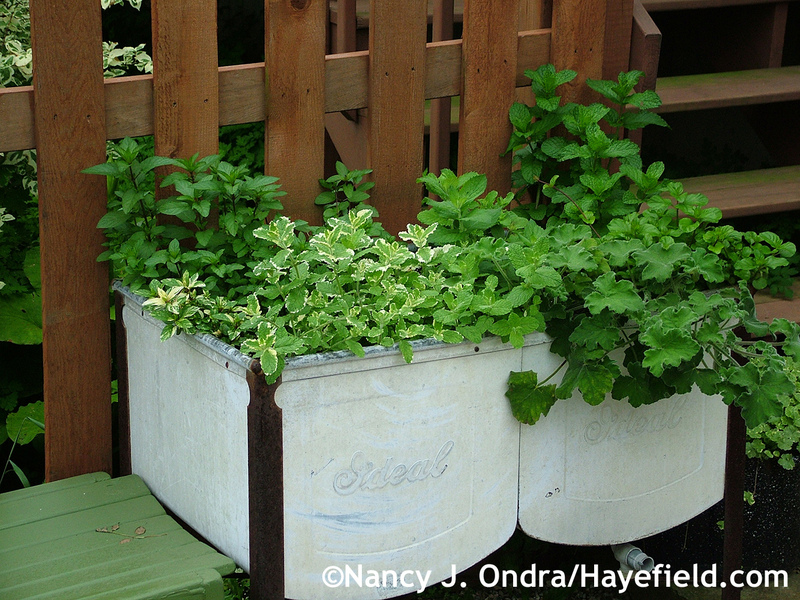 Besides keeping them corralled, containers raise the plants and put them within easy reach. I like to keep some of my favorites in an old washtub by my back steps, lifting and dividing them each spring, adding some fresh soil, and then replanting a small chunk of each. The leftovers get planted along what I call the Cottage Path, where they and other creepers spread as they like and I just mow a passage through them. 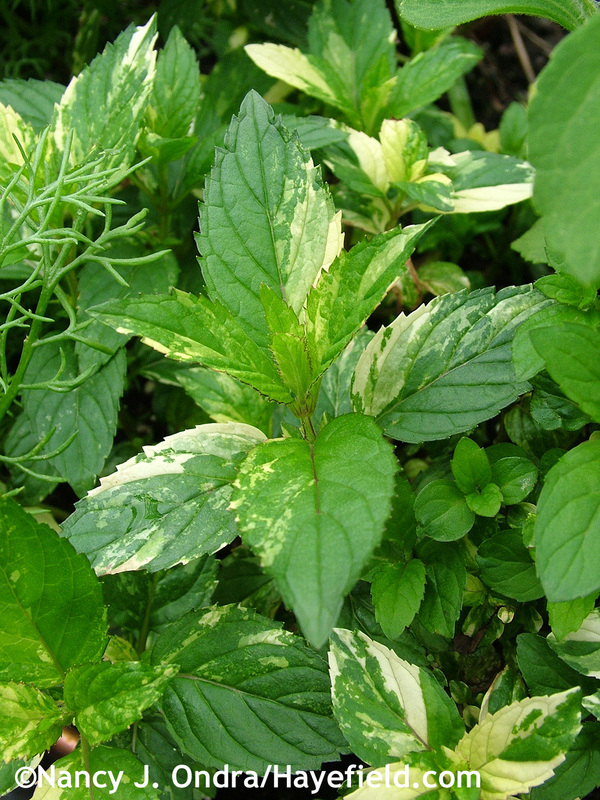 Pineapple mint (M. suaveolens ‘Variegata’) is one I always enjoy having around, because its variable but vibrant variegation is very pretty, though its light, sweet scent is more fruity than minty. 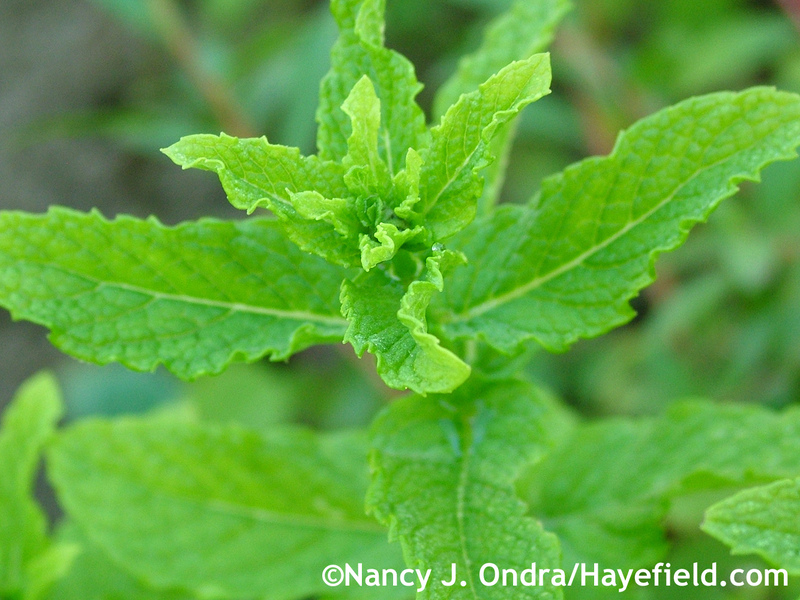 Spearmint (M. spicata) is also on the sweet side, but when you rub a leaf, you definitely know it’s a mint. For the pure, cool rush of menthol, peppermint (M. x piperita) is an even better choice. 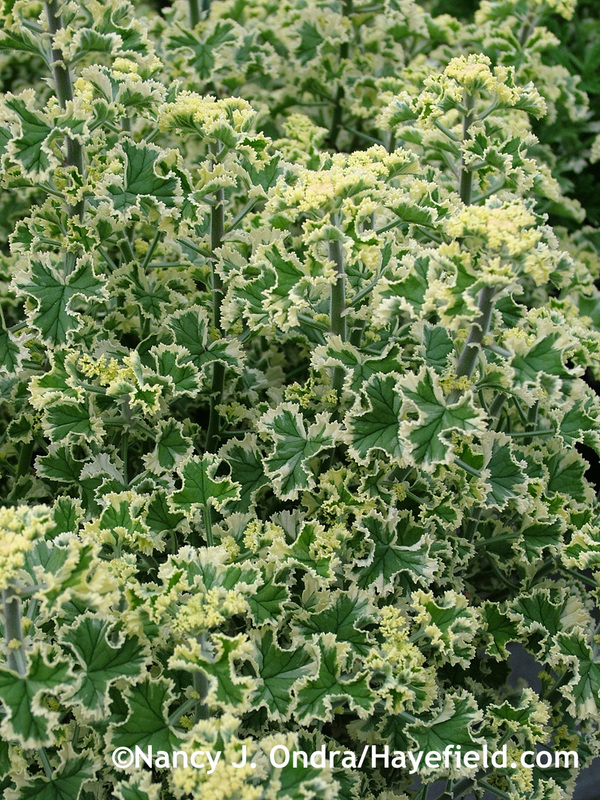 Sometimes I treat myself to a new plant of the variegated form for a bit of variety, but it reverts quickly to the solid-green version. 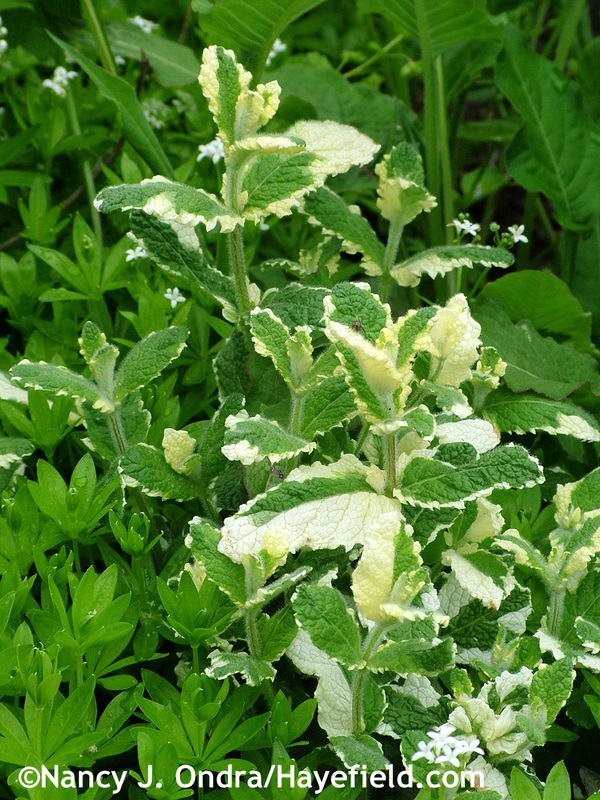 When I can find it, though, eminently whiffable Corsican mint (M. requienii) is my mint of choice. It’s a tiny thing, but its scent is really powerful. You may not even notice it growing in a garden path, but you’ll know its there once you step on it. While Corsican mint isn’t hardy here, I never hesitate to buy a pot or two (okay, yes, a whole flat one year, but I couldn’t resist) when I can find it. While it’s nice between stepping stones, I have the best luck with it in a pot, where I can water it carefully. Even then, it often fizzles out in August, but it’s fantastic while it lasts. Its fragrance is closer to that of pennyroyal (M. pulegium) than that of peppermint, because its power comes from a high content of pulegone rather than menthol. Anyone who has planted zonal geraniums (Pelargonium x hortorum) is familiar with the pungent, nose-wrinkling aroma of their leaves. I rather like that fragrance, but even more interesting are the species and selections grown specifically for their scents, ranging from fruity to spicy to resinous. They also tend to have very interesting textures, so you get to enjoy them two ways: when you feel them and then when you rub them and release their essential oils. While most retail nurseries carry only a few kinds, specialty nurseries offer dozens of deliciously scented selections. Buying online is an option, but then you have to depend on their descriptions of the scents. Being able to experience them in person is a treat, though one that can quickly be overwhelming. 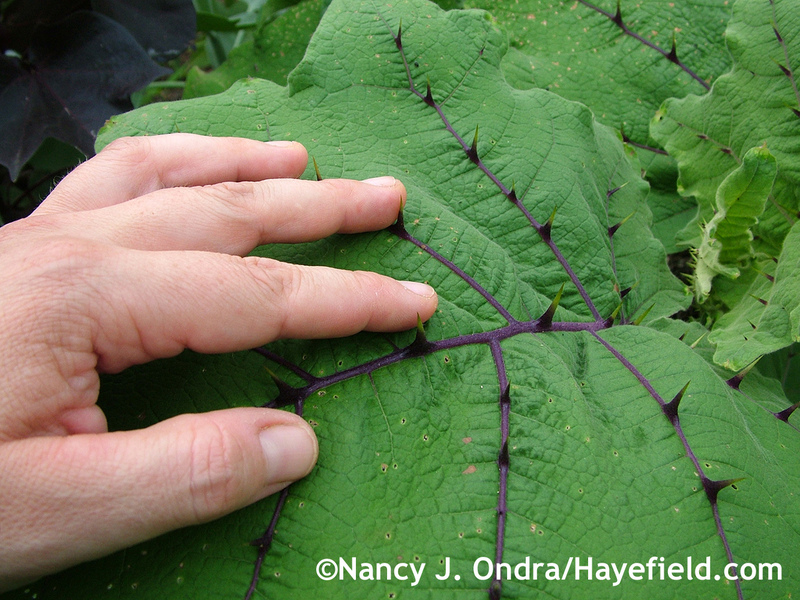 Once you’ve rubbed and sniffed a half-dozen or so, the scents get muddled on your fingers and the sensory input gets overpowering, and you need to take a break (and wash your hands) before fondling any more foliage. 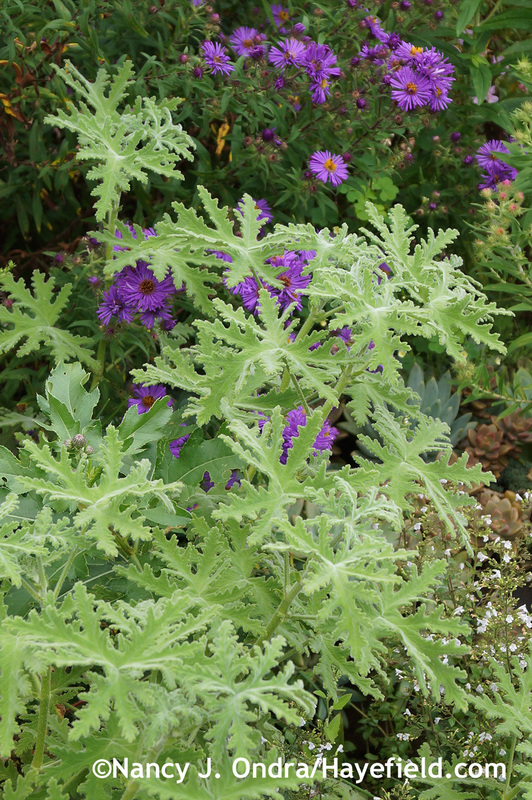 Pine geranium (P. denticulatum ‘Filicifolium’), above, is an interesting one, with deeply cut leaves that feel like stiff-starched lace and a pungent scent that’s somewhere between real and fake pine: hard to describe but memorable. 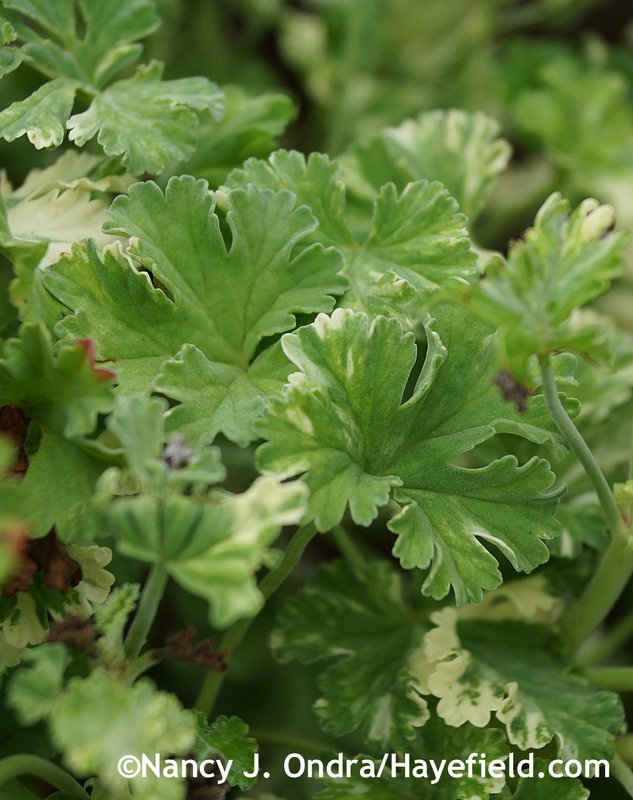 Variegated lemon geranium (P. crispum ‘Variegatum’; also sold as ‘French Lace’ or ‘Variegated Prince Rupert’), is another one that’s tempting to touch, with tightly crinkled leaves that have a citrusy scent. ‘Snowy Nutmeg’, a selection of nutmeg geranium (P. fragrans or P. Fragrans Group), also has small, variegated leaves (in this case, irregularly marked with cream), but it’s delightfully soft to the touch, with a rich, warm scent. The combo below includes three more scented geraniums that are very close to being my top favorites. Pale ‘Grey Lady Plymouth’ is one of the rose-scented geraniums (variously listed under Pelargonium graveolens, P. Graveolens Group, or P. x asperum), with a heavy old-rose scent. 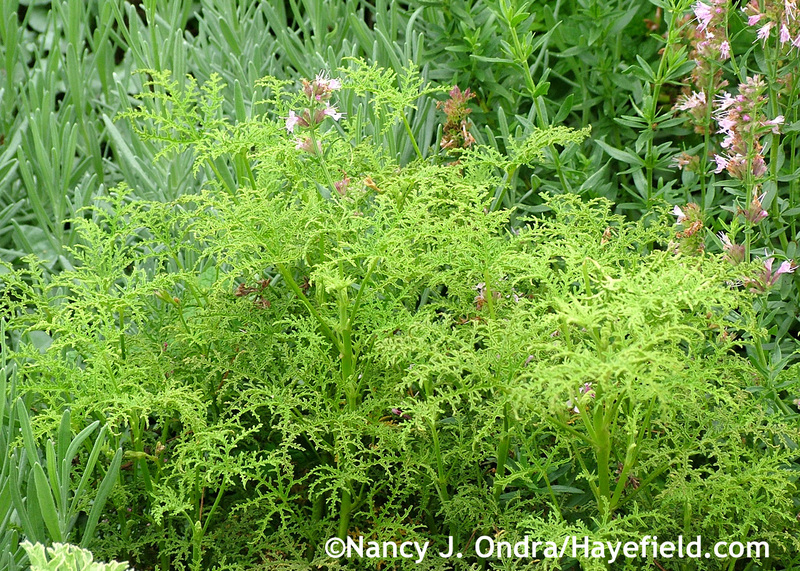 The small, scalloped leaves in the bottom middle are those of apple-scented geranium (P. odoratissimum): they’re velvety to the touch, with a sweet apple-cider scent. 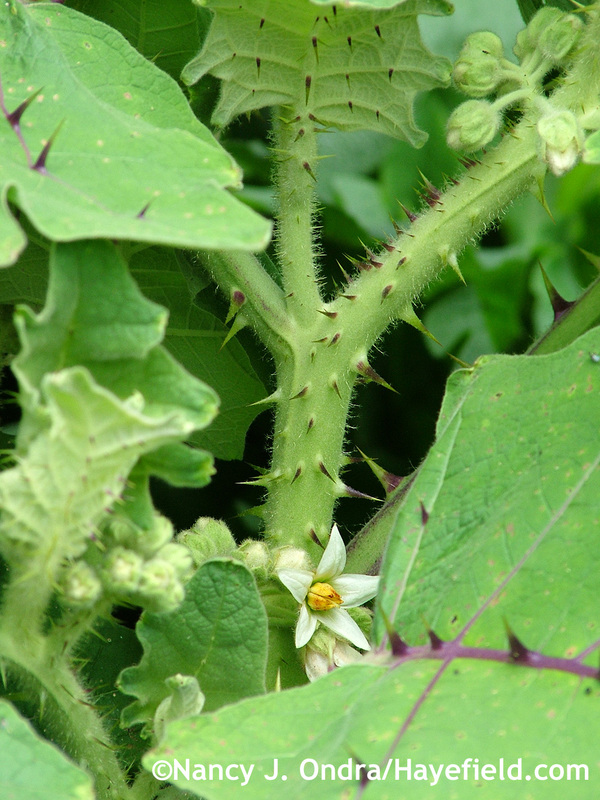 And the large, lobed, rich green ones? 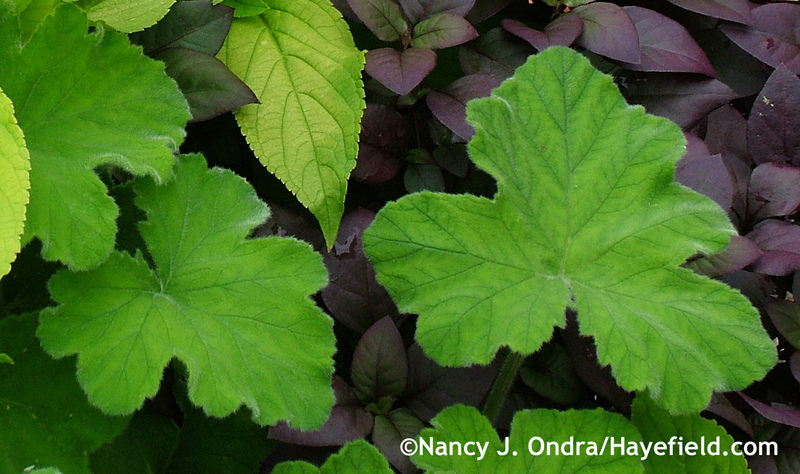 Those are ‘Chocolate Mint’, a selection of peppermint geranium (P. tomentosum). The “chocolate” part is only visual–a reference to the brown blotch on some of the foliage; when you rub the soft leaves, the scent is distinctly minty. Upright, bushy ‘Peppermint Lace’ is also lovely: equally good for scent and softness, in a pretty, pale gray-green color. 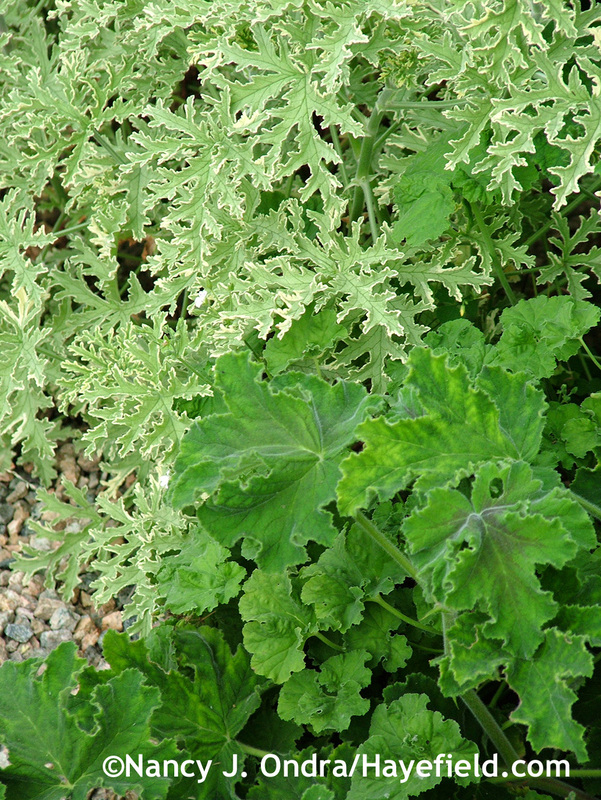 My top pick for touchability, though, is the straight species of peppermint geranium, because it’s practically impossible to resist petting its large, furry leaves and inhaling its clean, minty scent. It’s a vigorous grower, too: fantastic for filling big hanging baskets , cascading over the edge of large planters, or creating space-filling mounds of rich green foliage in beds and borders. 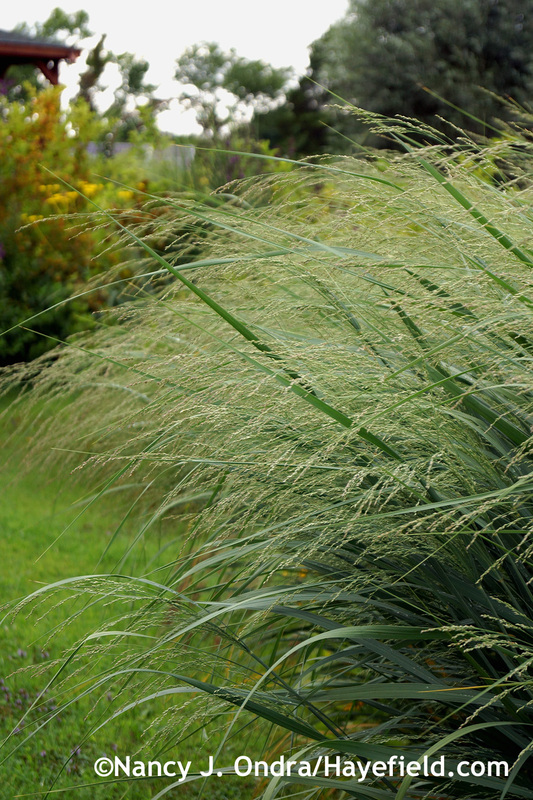 Ornamental grasses are beautiful to look at, and their rustling leaves can add an interesting element of sound to the garden. It’s even possible to find a few that are aromatic, such as cilantro-scented prairie dropseed (Sporobolus heterolepis) and citrusy lemon grass (Cymbopogon citratus); the latter offers flavor as well. And, touch can come into play with them too. Sometimes that’s not a positive experience: If you’ve ever tried to cut down a clump of miscanthus (Miscanthus) or pampas grass (Cortaderia) without wearing gloves, or even brush past one without long sleeves, you already know how wickedly sharp some of their leaves can be if you rub them the wrong way. 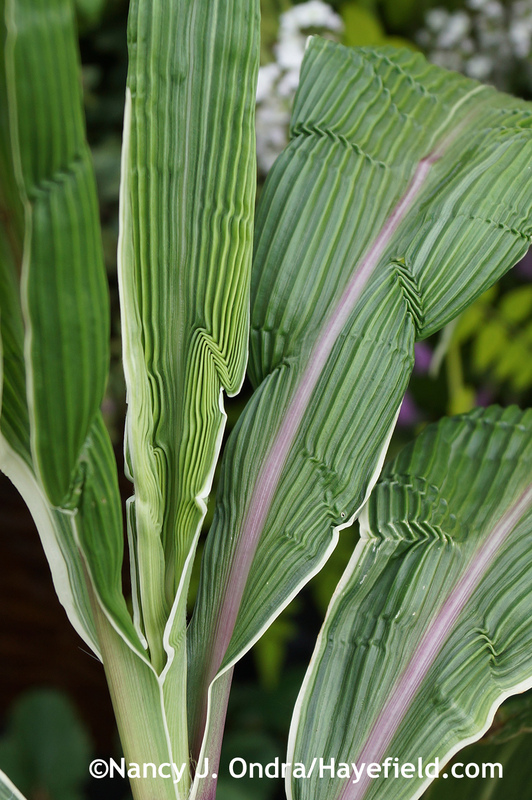 Variegated palm grass (Setaria palmifolia ‘Variegata’) is one whose leaves are pleasant to touch: particularly the newly emerging ones, which have a strongly corrugated texture. The flowerheads and seedheads of some grasses can also be quite interesting to handle. 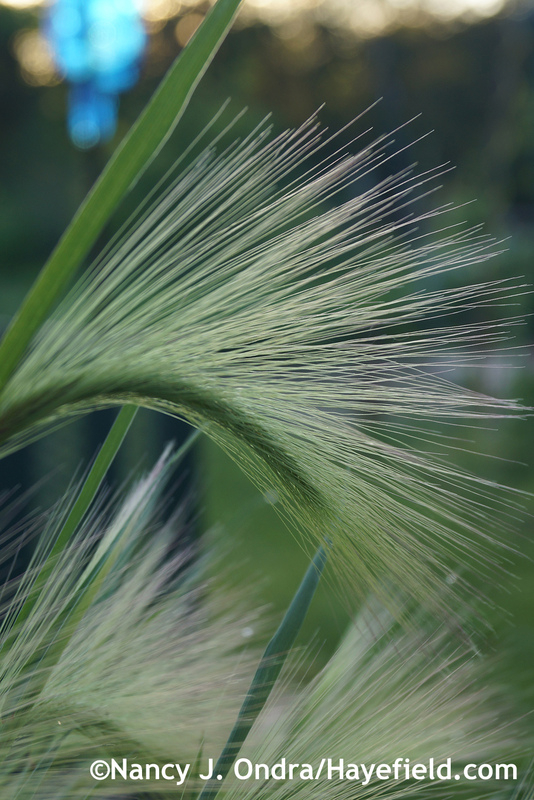 The arching panicles of bitter panic grass (Panicum amarum), for instance, feel cool and silky. Foxtail barley (Hordeum jubatum) looks like it would be soft and feathery, but those long awns are surprisingly stiff. 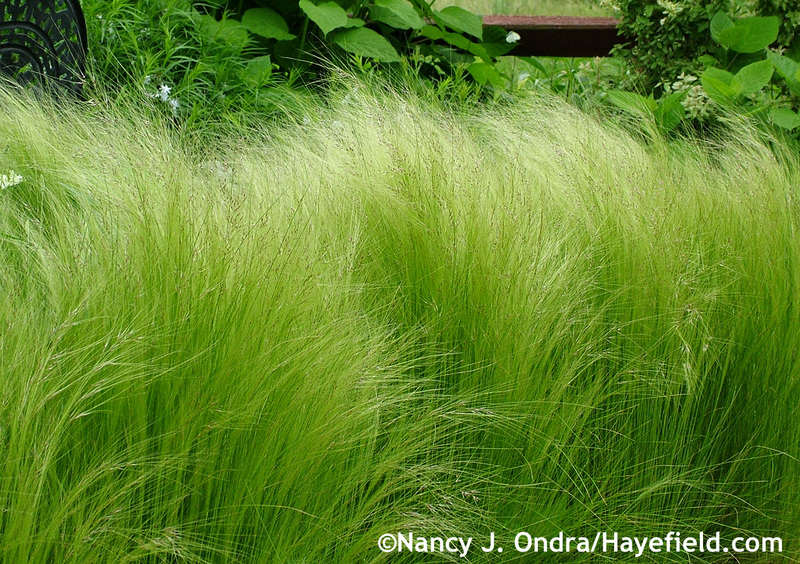 My favorite “touch me”grass is Mexican feather grass (Stipa tenuissima or Nassella tenuissima). Wonderfully wispy and silky in bloom (above), it’s a bit stiffer but still nice to run your fingers through when it’s forming its seeds, and it remains flexible even in winter. I very much enjoyed having lots of it along a frequently used path, where I could brush the tops as I walked by. Lamb’s ears (Stachys byzantina) are, of course, a classic choice for touchable leaves, but there are also some fuzzy-looking blooms that invite tactile exploration. 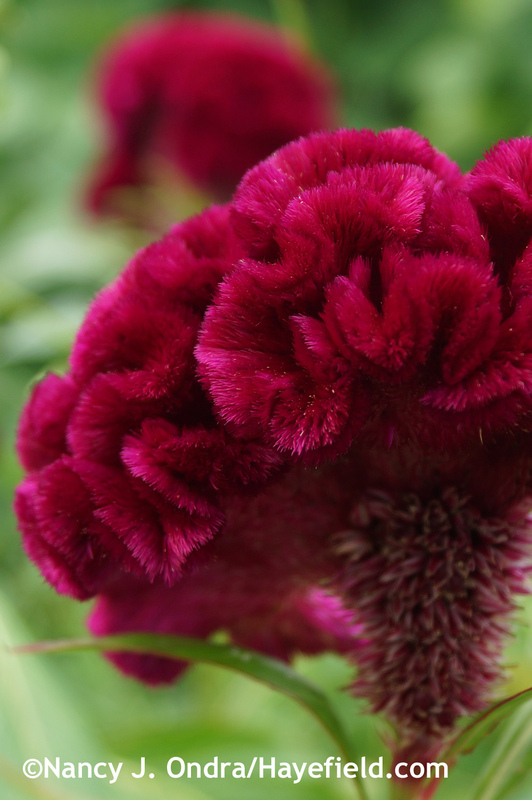 Just try keeping your fingers off of the intricately crinkled heads of crested celosia (Celosia argentea Cristata Group), for instance. 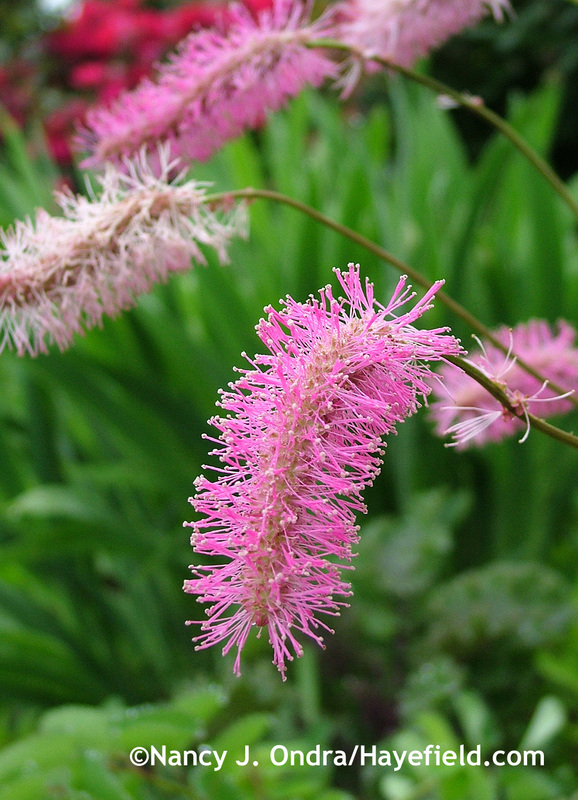 The bobbing tails of Japanese bottlebrush (Sanguisorba obtusa) are also terribly tempting, and they too are tall enough to be within easy reach. 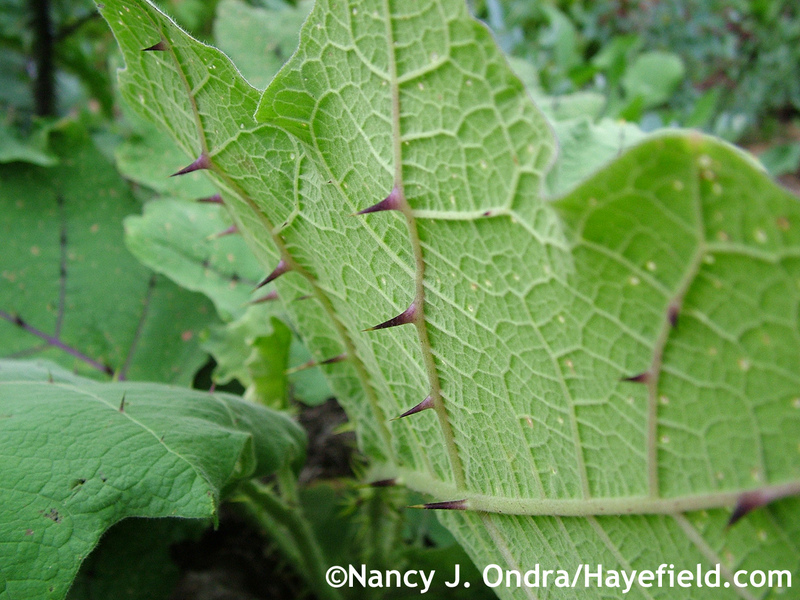 The furry tails of chenille plant (Acalypha reptans) are equally enticing to tug on. 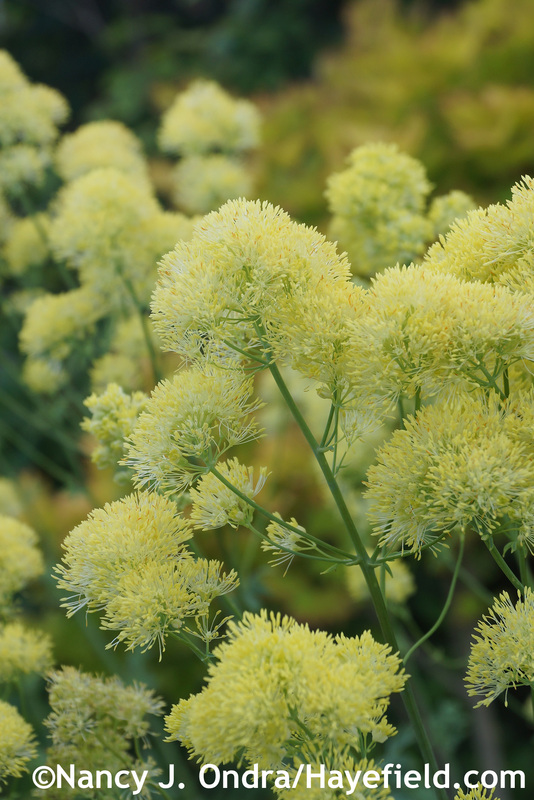 The lemon sherbet-colored blooms of yellow meadow rue (Thalictrum flavum ssp. glaucum) look good enough to eat, and they’re sooo soft. 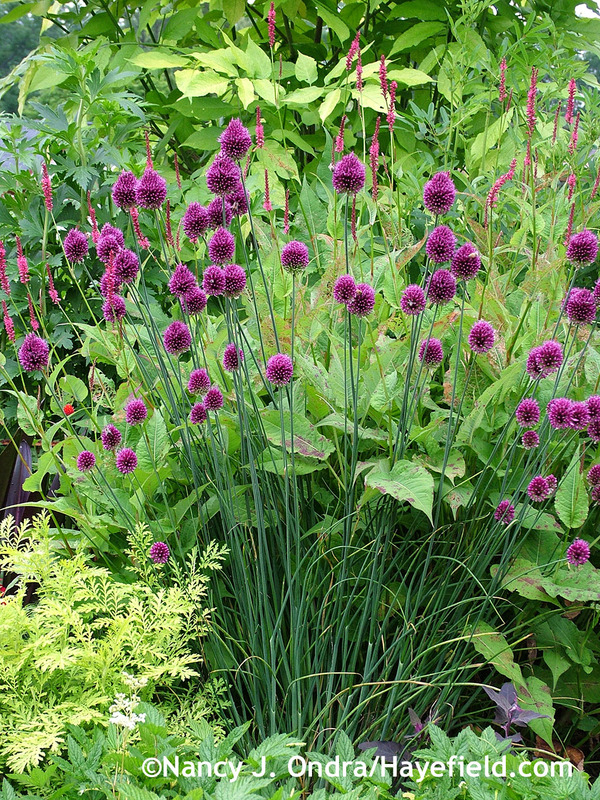 It’s the ornamental onions (Allium), though, that get my vote as top-notch please-touch flowers. 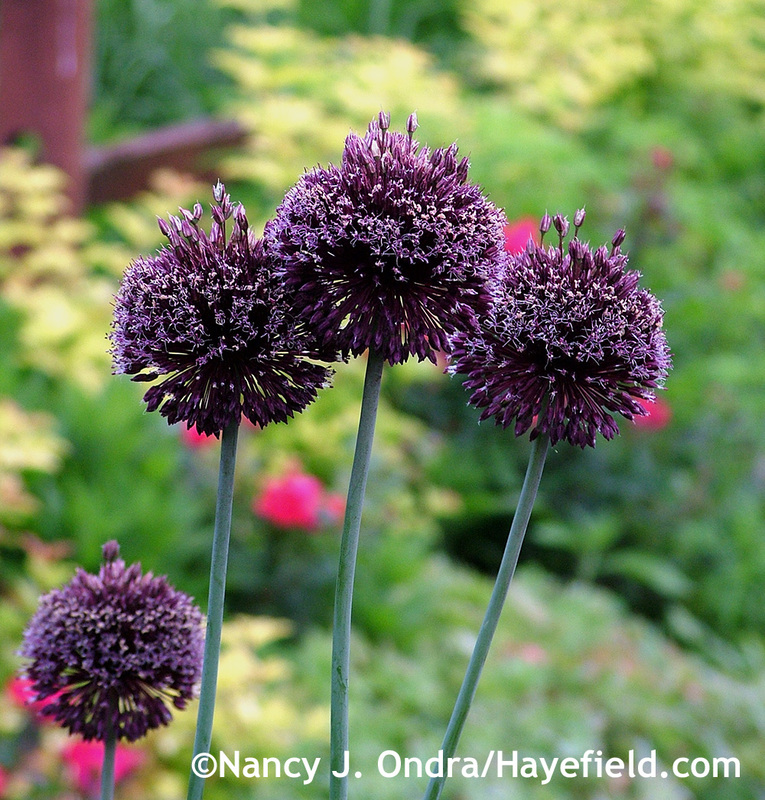 It’s fun to bat around the small, ball-shaped blooms of drumstick chives (Allium sphaerocephalon), as long as you make sure that there are no bees on them first. Many sources say that the plum-sized spheres of ‘Forelock’ reach just 30 inches tall, but here they consistently reach 4 to 5 feet. There’s no need to even lean over to interact with them. My top favorites are the fuzzy globes of the giant onions. Two tie for first place: grapefruit-sized ‘Gladiator’, because it’s tall (4 to 5 feet here), and ‘Ambassador’, which, though shorter, has even larger heads. Both are soft to the touch but also sturdy enough to stand up to a firm pat as you pass by, whether they’re in full flower, as above, or heading into seed, when they have more of a rubbery, Koosh-ball kind of feel. Crinkly, knobby, or wrinkled bark is always interesting, but trees with smooth trunks are especially enticing. Touching the trunk of ironwood (Ostrya virginiana), for instance, is a lot like running a hand over a horse’s leg: it looks smooth on the surface, but you can feel the subtle ridges and ripples underneath. 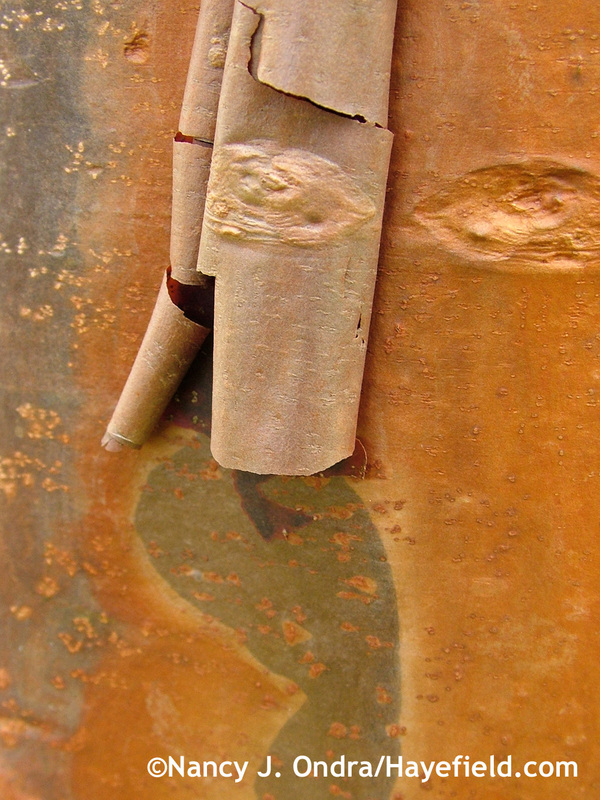 When the smooth surface is combined with peeling bark, as on crape myrtles (Lagerstroemia), you get beautiful patterns as well. I’ve never had luck getting a crape myrtle established here, unfortunately, but seven-sons tree (Heptacodium miconioides) has been really easy, and it’s also quite nice stem-wise. The bark gets really shredded in late spring, as the trunk expands with another round of growth. The strips on my older plant are quite large, to the point they look a bit messy, so it’s very satisfying to pull them off and reveal the pale bark beneath. From a distance, the trunks look as smooth as milled lumber, but up close, you can see (and feel) that there are vertical ridges, and some horizontal rumpling as well. Even better, though, is paperbark maple (Acer griseum). 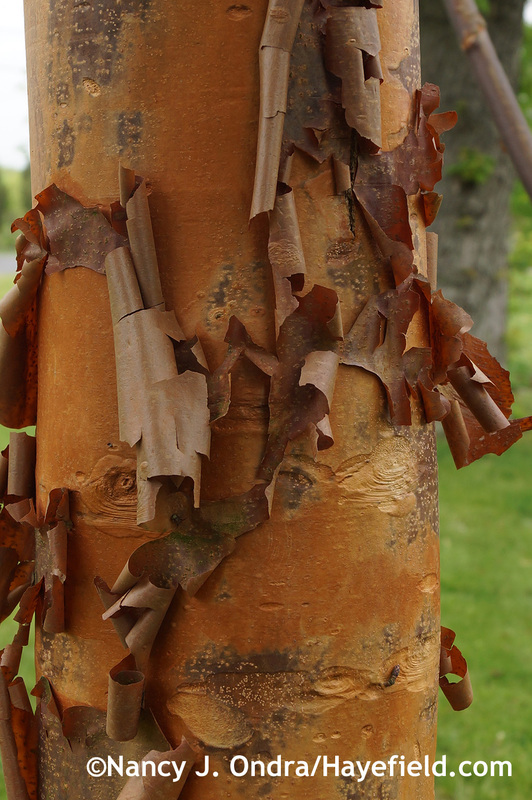 It too has peeling (or decorticating, or exfoliating) bark, but the layers are much thinner. It’s tempting to rub off the shaggy-looking curls, but if you leave them in place, they have a beautiful glow when backlit. The trunk underneath is so smooth that it feels more like a piece of cool stone than wood. Isn’t that a wonderful color, too? Plus 1: Don’t Do It! 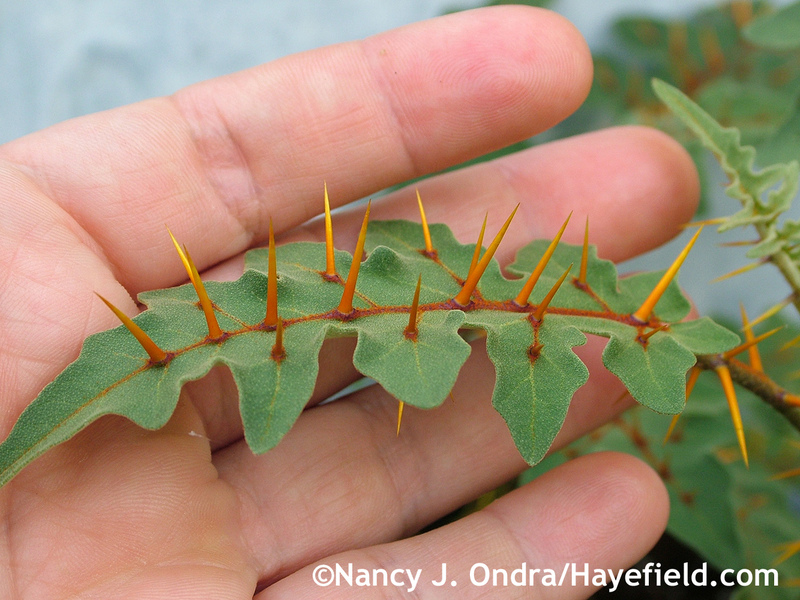 And then, and then…the plants that folks insist on touching, no matter how strongly you advise against it. 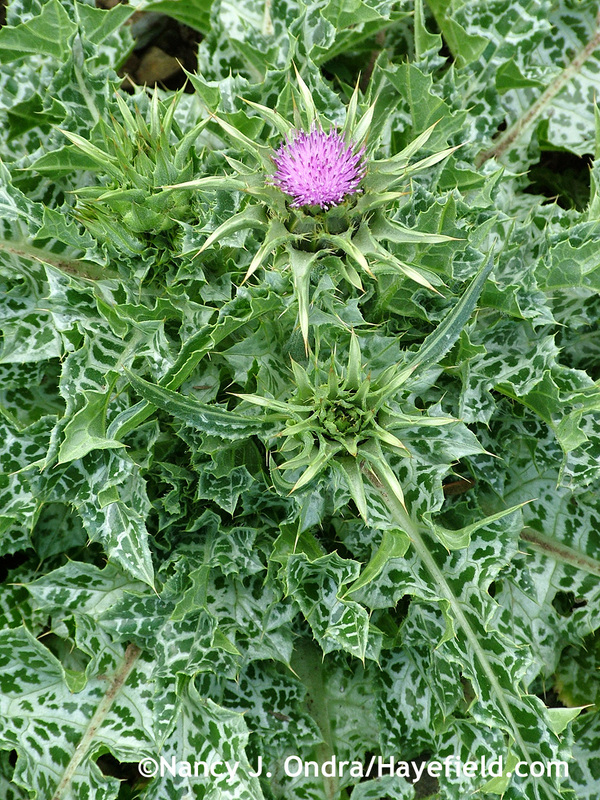 You know them: the obviously spiny things, like sea hollies (Eryngium) and milk thistle (Silybum marianum), with sharp bits that go right through all but the toughest gardening gloves. You’d think any sensible person would stay far away from them, but invariably, at least one person in any group just has to reach out and touch. …and they add an unexpected touch of wickedness among more civilized companions. There’s a practical factor, too: I’ve never seen deer or rabbits messing with any of the spiny solanums. Would you want to take a mouthful of that? 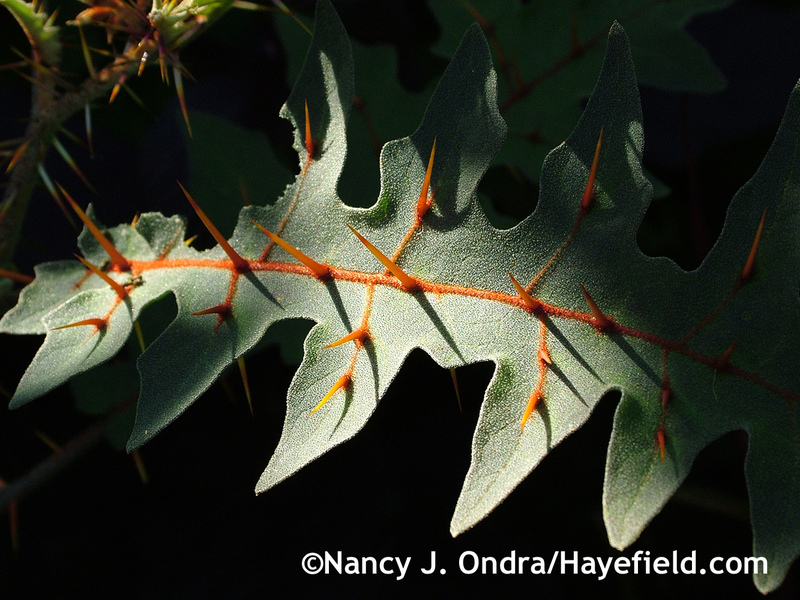 Bed-of-nails (Solanum quitoense) is big and bold; porcupine tomato (S. pyracanthum) is smaller but with more abundant and more colorful spines. 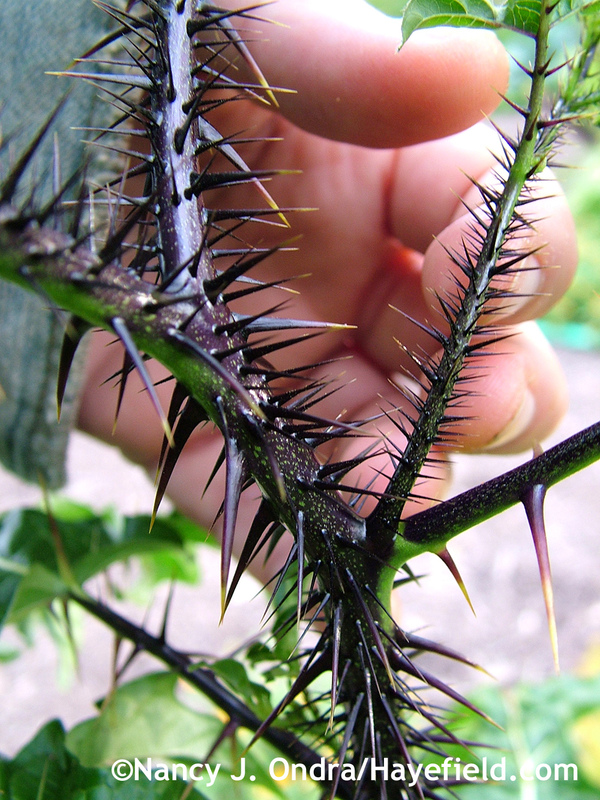 My current favorite of the bunch, though, is malevolence (S. atropurpureum), for its sheer abundance of absolutely evil-looking spines. You just know how those needles are going to feel, and if you had any sense you’d admire them afar, but oh, don’t listen to me, you’re going to touch them anyway. I do. 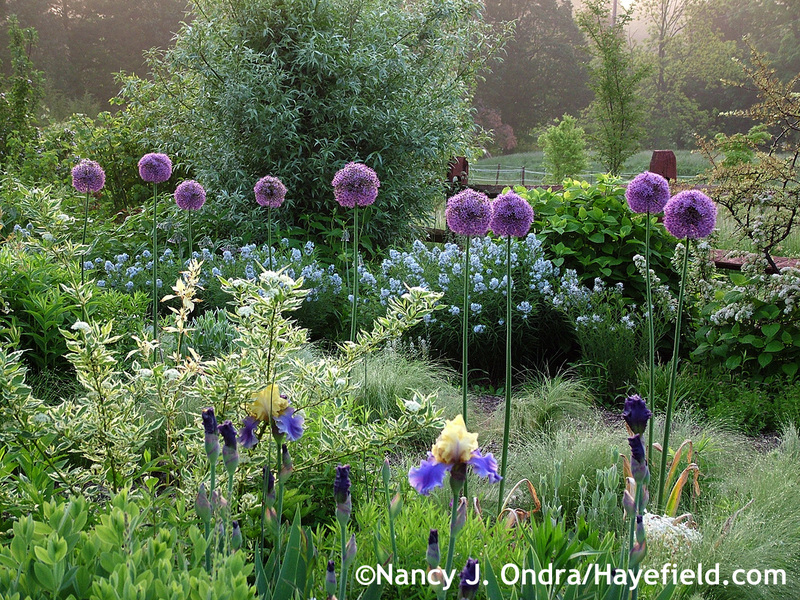 So, what are your feel-good favorites in the garden? Are you a fan of fragrant foliage, or delicately crinkled petals, or big, study blooms that hold up to rough handling? I’d love to hear about them! A final note: I’m planning to take a bit of a blogging break for a while, so my next new post won’t be until January 15th. I’d like to take this opportunity, then, to thank you all for visiting and wish you a very happy holiday season. Hi Sue! Oh yes, those are all wonderful choices. I too really love lavenders–especially yellow-flowered L. viridis: it’s not hardy even here but easy enough to grow as an annual just for touching. It’s a very different scent from other lavenders. Good luck getting through the winter! Thank you Nan for a wonderful year in your garden. It was just wonderful and I am waiting to go thru it next year. This post again has it – just great! Two of my favorite to-touch-plants is Stachys byzantina for its soft hairy feel and Helichrysum italicum for its curry smell. Best wishes to you and all the other reader. 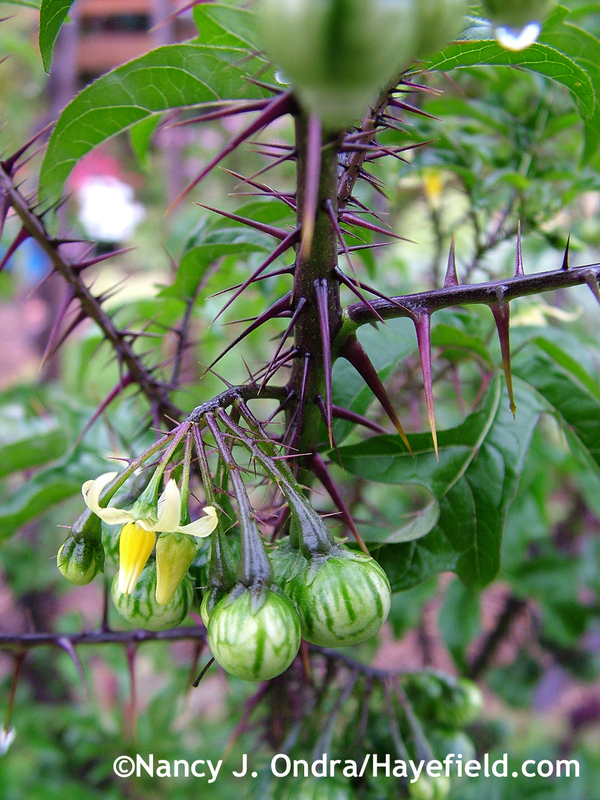 How could I have forgotten curry plant? That’s one I never get tired of. And lovely lamb’s ears too: definitely pettable. Speaking of which: my best to your pups–and to you too! I’m definitely a plant toucher! Fragrance is my thing, and I didn’t know about the different geranium scents so thanks for educating me! A few more favorites that you didn’t mention here (can’t have enough mints!) 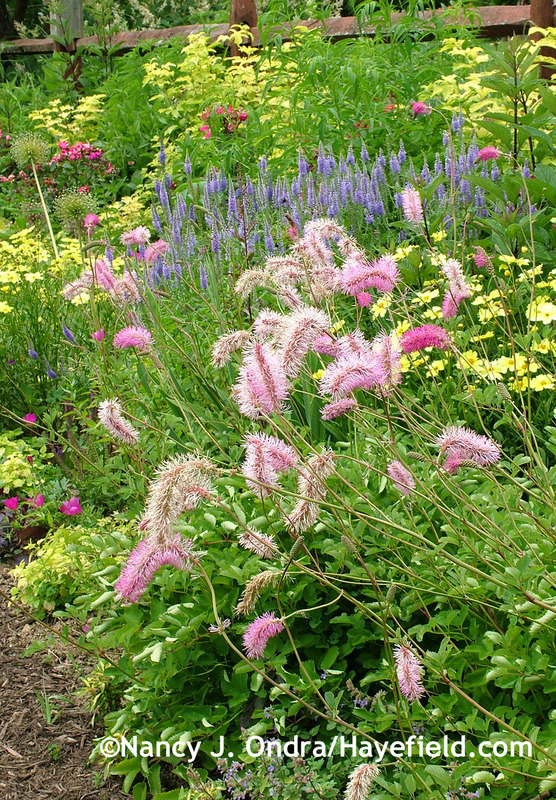 are Agastache — any variety really, but A. foeniculum and A. rupestris are my two faves. For grasses the seed heads of Chasmanthium latifolium are hard to resist, and I always have rosemary and thyme nearby. The fragrance that does the most for me though is Plectranthus ‘Cerveza ‘n Lime’, and those fat, fuzzy leaves are irresistible too! Agastaches, absolutely! Chasmanthium seedheads are fun too. Have you ever seen ‘Fairy’s Joke’ tufted hair grass (Deschampsia cespitosa), which has dangling plantlets instead of seeds? It’s amusing in a similar way. It’s been a while since I’ve grown the scented plectranthus, so thanks for reminding me about them. I’m not familiar with ‘Cerveza ‘n Lime’, but I will definitely check it out! That’s so kind, Deborah. Thanks so much for visiting today! The flowers on smoke tree (Cotinus) get my vote. Spongy. And, yes, I could never walk through a garden without touching and smelling. Seeing is only one part of it. Hearing is another like the scrunch of fallen leaves. Great post. Yesss…good one, Jane. I don’t often get them since I cut mine back hard every year, but I think I’ll leave one unpruned this coming year to have some of the flowers to fondle. Scrunchy leaves are pleasant too. Since I don’t have many trees, I use gravel paths for a similar sound; it has a nice feel underfoot, too. Love your posts and fabulous photos. Hope your hiatus is taking you to some beautiful place. How about Silver sage (Salvia argentea),lavender of any kind, lemon verbena (Aloysia citrodora), and Bunny tails (Lagurus ovatus)? Good morning, Ilene! No, no traveling; the break is just so I can concentrate on my book manuscript. All of your suggestions are excellent. I should have had additional categories for fuzzy foliage and lemony leaves; so much for trying to fit into the “5 plus 1” theme. And bunny tail–of course! That is absolutely irresistible. Thanks for all your effort and the great information you provide. I always look forward to your posts. Blessings and have an enjoyable Christmas season. Thanks so much, Mike. It’s great to have you as a reader! Hope you and Mom had a nice Thanksgiving. I wanted to thank you for all of the wonderful posts this past year: outstanding images, informative words and unique garden inspiration all offered with a warm and generous heart. While I understand the necessity for a breakaway, six weeks without hearing from you will be a very long pause. On the positive side – I look forward to reading your first post of the new year on my birthday. Wishing you and your family all the very best! Hey there, John! I’ll do my best to come up with something good for your birthday post. Let me know if you have any requests. All the best to the whole Drexel clan, and to your new garden too, from me, Mom, and the boys. This was a wonderful post to close out your blogging year, Nan. I love the tactile qualities of plants myself. In addition to some of those you named, like Pelargonium tomentosum and Mexican feather grass, I plant a lot of Coleonema (aka Breath of Heaven) and lots of spiky Agaves, Dyckia and Aloe (which have yet to prove effective in putting off my raccoon visitors). 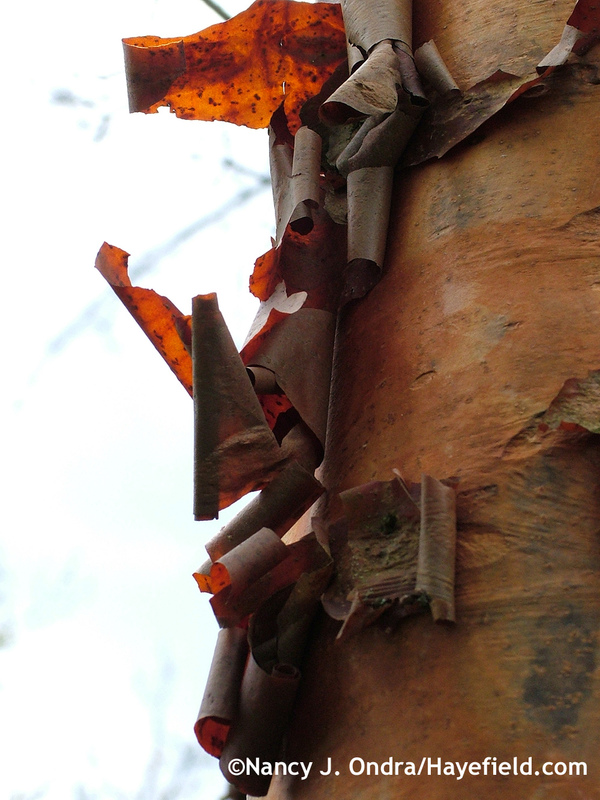 In my garden, Arbutus ‘Marina’ provides touchable, flaky red bark. Best wishes for a bright holiday season. I look forward to seeing your 2015 posts. Coleonema is a new one for me, Kris; I’ll have to look it up and read more about it. I do remember a painful run-in with a potted agave, though, so that’s one spiny thing I wouldn’t ever be tempted to touch again! That was a fun read, Nan. Didn’t realize I was such a hands on plant fondler sort of person. I thought everyone was like that! I enjoy touching most plants, including the fuzzy beards of iris, the purple buzz cuts of the artichokes, the smooth and cool rose petals, the dearly delicate pansies. I get cheap thrills running my fingers up and over thorny stems, the corrugations of kale, and risking a slice of flesh grooming my Stipa tenuissima. Actually, I wish I could treat many of my plants like I do my stipas – I regularly get down on my knees with a hand rake and lovingly, worshipfully comb out their tresses. Actually, it wouldn’t surprise me at all to learn you do the same, Nan, as your stipas look particularly well coiffed. Have a wonderful Christmas, Nan. Thanks so much for all you have given me in your books and posts and ‘see’ you in the New Year. You’d think all gardeners *would* get great pleasure out of handling plants, but from what I’ve seen, it’s not that way. In some cases, it’s the “want to have a garden” folks (as opposed to those “want to garden”) who prefer to just look; in other cases, it’s people for whom gardening is more of a job or obligation than a pleasure. Well, we all have different priorities. Your mention of kale is a good call: the crinkly leaves of ‘Redbor’ and the pebbly surface of ‘Lacinato’ are both really neat. And yes, I too groom my Stipa, with a metal comb that I usually use to fluff up the boys’ forelocks, so the seedheads don’t get matted and spoil the nice arching with their weight. (And yes, because it’s also a good excuse to play with the plants.) Have a restful winter, Barbara, and enjoy your planning for next year! Thanks for all the photography and selection and writing, Nan, and best wishes for forward progress with your book. Looking forward to the new year! That photo of the rippling on the trunk of Heptacodium miconioides is mesmerizing. It reminds me about a new book that’s on my Christmas list — you may already have heard of it, but if not it seems like something you’d definitely enjoy: Bark: A Field Guide to Trees of the Northeast by Michael Wojtech. There’s a very worthwhile interview with the author on awaytogarden.com. One of the plants I find irresistible to touch is Amsonia hubrichtii. Mine were swallowed by rampaging asters during a decade of neglect, but I’m going to plant some more next spring. In fact, it was googling them that led me to hayefield.com for the first time. Hi there, Nell! I’m so glad that you found your way here, and that you’ve come back since then. Best of luck getting your amsonias going again. You’re so right about A. hubrichtii being a pleasure to touch (as long as you brush the plants gently so you don’t get the sap on your hands). And thanks for the tip about the field guide; I will check it out! I have a cat who’s obsessed with Mexican feather grass. Dives in it, rolls in it, hides in it. When I’ve fully submitted to becoming a crazy cat lady, I’ll give him his own garden of Nassella. (Probably next year.) 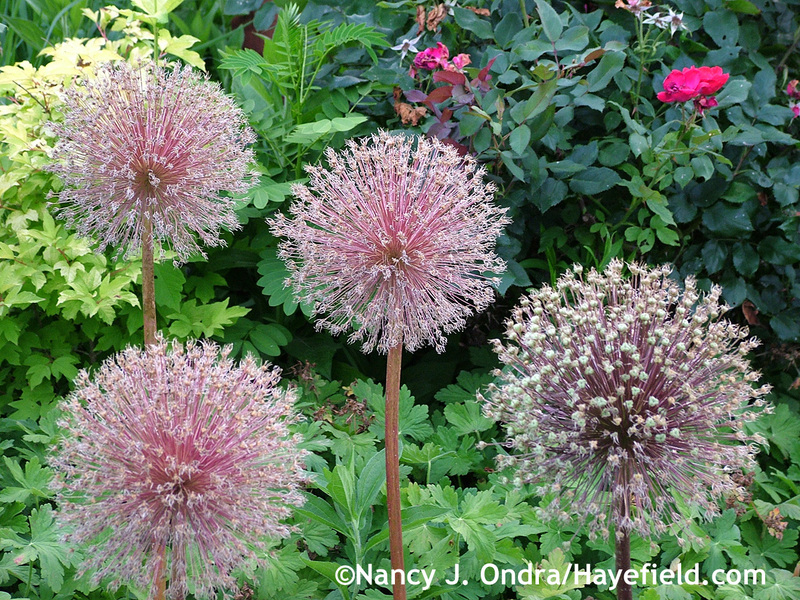 Love your description of “Koosh ball” alliums and the “horizontal rumpling” of heptacodium. Looking forward to your posts next year. Have a great winter! Who needs catnip? Your little buddy obviously has refined tastes, Amy. Here’s looking forward to the new gardening season! Nan, I just came across this post… I had such a backlog of email develop while I’ve been undergoing treatment again and it somehow got lost. By now you are on your holiday hiatus and I am hoping that it is a truly restful, peaceful, restorative, and enjoyable one! I am another person who didn’t realize just how much of a touchy feely person I am — not so much in others’ gardens where I tend not to touch without permission (I’ve been known to get carried away weeding other people’s gardens….) but in my own, or at a garden center or botanical garden, I touch everything (unless there are signs posted forbidding such activity). For me, being able to experience means to see, smell, and touch. I absolutely love your solanos. Oh my, I have some places I would have loved to have put a few of those in our Massachusetts garden! Here is California, we are still suffering major garden withdrawal but the grounds of the residential community where we are living temporarily have been well landscaped with a wide array of plants and shrubs I’ve never seen before so it has been nice for us, getting to know an entirely new population of shrubs and perennials while we search for a new home in California (our original home in California, which we had just moved into, was destroyed in the Napa earthquake in August). As usual, your photos are feasts for the eyes, your variety of plants never ceases to amaze. 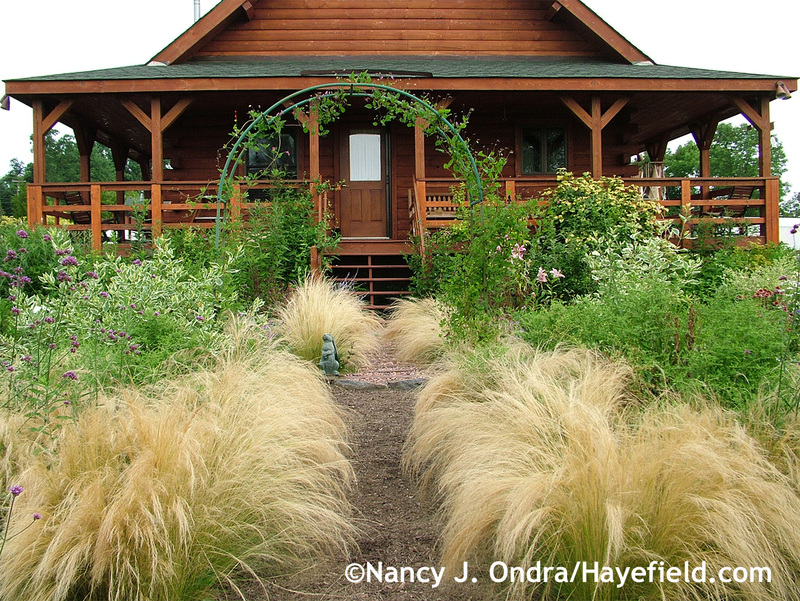 And I love the idea of letting the mints run wild and simply mowing a path through them. My favorites to touch? Herbs, as I love the fragrance, and lambs ear. Have a wonderful respite, and a joyful holiday season. Oh goodness, Cathy, you have had a rough year, haven’t you? I will send good thoughts your way, and best wishes for a much brighter 2015, with good health and a lovely new home where you can start your new garden–complete with lots of good scents!